Telugu superstar Mahesh Babu, who is currently in New York shooting for his upcoming film Maharishi, has been accompanied by wife Namrata Shirodkar and their kids - Gautham Ghattamaneni and Sitara, who seem to be having a great time in New York (going by the photos shared by Namrata Shirodkar). From the photos shared by the actress, it appears that she is having a fun time with her kids exploring the Big Apple. The former beauty queen, who has been actively sharing her pictures from their vacation on social media, added more pictures to the album. Namrata's latest Instagram post features her son Gautham and daughter Sitara, who can be seen smiling at each other. Namrata captioned the post: "You and me... Me and you." 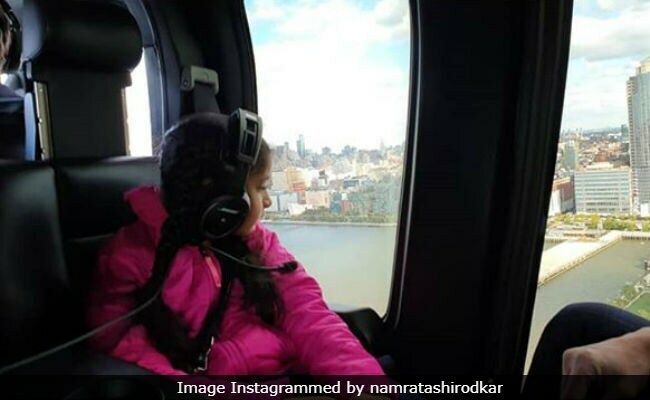 On Monday, Namrata Shirodkar shared a picture of Sitara's first helicopter ride and we can clearly see the excitement on her face. "Getting a top view of the Big Apple. Sitara's first ever helicopter ride with her father by her side," read the caption on her post. She accompanied the post along with a hashtag "#thatexcitementonherface." Last month, she shared a picture of Sitara along with her "favourite girl" Alia Bhatt (who was also in New York). "Sitara's day out. Her most favourite girl of them all. Thanks Alia for bringing the biggest smile on her face," read the caption on Namrata's post. Namrata Shirodkar married his Vamsi co-star in the year 2005. Namrata, a former Miss India, has featured in films such as Bride and Prejudice, Dil Vil Pyar Vyar, Tehzeeb and LOC Kargil among others.